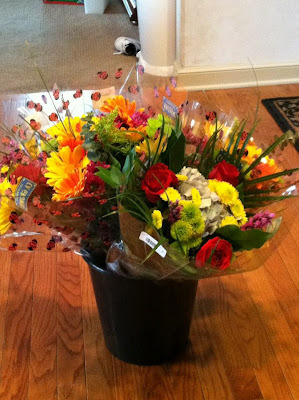 I never really did have much of a pity party after Friday's nut allergy news. It was right down to research and shopping and taking online polls and adding friends with food allergy experience to my "favorite contacts" list. MAN. Do I have a lot to learn!!!!! I was hitting the stores in the area this weekend to check out the options for my little guy. It will definitely be a challenge. I was already buying gluten and wheat free...but now I have to add nut free. It's not as easy as you'd think! One more NUT allergy question. How critical is it to stay away from products that say "made on shared equipment with products containing nuts...". So many things say that!! Turns out this is very important to stay away from. It's important to not risk contamination. A nut allergy is not to be fooled with or taken lightly. Brian had hives - but the next reaction could be anaphylactic shock. You just never know. 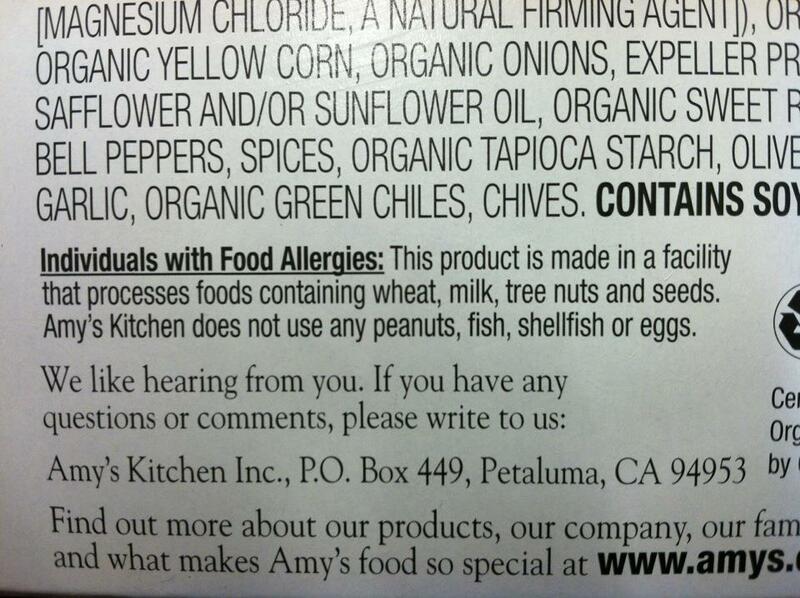 So Amy's kitchen has this on its label...what would you peanut allergy mom's do? Clearly I am still learning - still processing. I was grateful for the kind, non-judgemental responses. Anyone could have said, "What the heck! Are you kidding me?? Why would you even THINK of taking that risk?!?!? Do you not love your kids??" Joking, of course, but in hindsight I can see the absurdity of my questions. I'm a rookie - what can I say. The truth is, to find a product free of all three...that isn't made on shared equipment with peanut products...or made in a processing plant that produces peanut products...is hard. At least if you shop like me. I have always made it very clear - I'm not good in the kitchen. Not at all. I cook the same things over and over and leave the fancy type of cooking that requires doing two or more things at once...and getting timing down...to Ed. He's super fancy in the kitchen. I prefer frozen food and crock pots and if you use words like "braise" or "blanche" or "simmer" I might have a panic attack. But...perhaps that's all part of the plan. You know how I always say that God sends you the children you are supposed to have? The children you need? Well - this is proof. Gavin had a seizure that now requires extra vigilance and emergency medicine on hand at all times - and he's gluten and wheat intolerant. Brian was diagnosed with an allergy to peanuts, tree nuts and cashews that requires an EPI pen on hand at all times. And he's gluten and wheat intolerant, too. To me, it's a message. (And yes, I know I'm weird) In it, I am told that the extra vigilance...the loving food label dissection...the emergency kits I made for our kitchen in case something happens when we're not home (more on that in a separate post)...these are all things that force me to be even more "present." So if you criticized me before (even in your head) for being a "helicopter Mom"...I think it's about to get worse. Or better, if you have an outlook like me. And the special diets - first Gavin's and now Brian's - the food that is usually organic and typically much better for you than what we used to feed him...is doing something else. It's...gulp...getting me in the kitchen. And, not only that. It's forcing me to look at how I eat. It's forcing me to look at a whole lot of things, actually. Lots of changes going on around here. This weekend a friend posted this Harvard study on her Facebook page which made me sick to my stomach. I'm sure it's not new news - that the hormones in our food and our milk is linked to cancer - but I guess now I was ready to do something. So we switched instantly to Organic milk...and meat. Also this weekend we hired housecleaners that are environmentally friendly - they only use microfiber cloths. And, even better - they don't use any chemicals. No bleach or ammonia or anything that would be harmful to the boys. Especially Gavin who puts his mouth on everything. Brian will have a "safe snack bin" at school. He's going to help me decorate it and is very excited that each day he gets to choose from the snacks that I provide. I talked to his teachers and they now have Benadryl and an EPI pen with instructions on what to do and how to use it in the classroom. And I requested a meeting with the school nurse, which will happen tomorrow, so I can tell her about Brian. We also might do something a bit unconventional. The Acupuncturist that I saw, Dr. Kang, may be able to help desensitize Brian to his nut allergies. Perhaps even treat the gluten and wheat intolerance in both boys. I'll be talking with her tomorrow and am very excited about this possibility. I'll be sure to tell you all about it. In other news...Gavin is feeling better but is still being slammed by allergies. And we realized today that the gorgeous bucket (yes, bucket!) of flowers that Ed brought home after the bad "nut news" on Friday were leaving pollen everywhere. It didn't dawn on me until today when he seemed extra congested. We felt awful. So the beautiful flowers were relegated to the laundry room. For his seasonal allergies, I switched him from Claritin to Allegra on the advice of his allergist. Hopefully soon he will find relief. Despite his constant congestion, he's still one happy boy!! And despite everything we've been through and are going through - I am one lucky woman. I have too many blessings to count. If you are a Mom (or Dad! or human!) 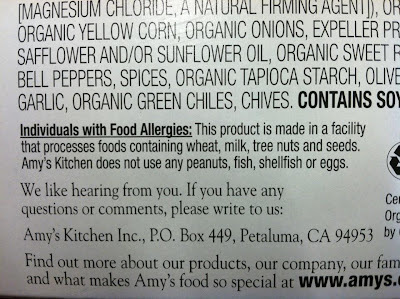 that is dealing with food allergies...please friend me on Facebook if you haven't already. I post lots of questions - and don't see that stopping anytime soon. I'm getting so many great suggestions from label reading to how to handle Easter egg hunts. I'd love for you to be part of the discussions. You can find me with by clicking the Facebook link at the top right of this page. You keep saying that Gavin is wheat and gluten intolerant. They're the same. Gluten is a protein that's in wheat. It's like saying he can't have oranges or orange juice. Anonymous above is obviously an expert and has had much more time to learn about Gluten intolerance, I had no idea they were the same and probably would be saying it that way as well Kate.... I am sure you too will be a pro one day (unfortunately) and can probably teach others as well, but I bet you will be more kind about it. Gluten and wheat allergies/intolerances are not one and the same, there are so many more things that have gluten in them....keep up the good work, mama. Hugs Kate....keep up the great work!!!!! Your boys are so lucky to have you!